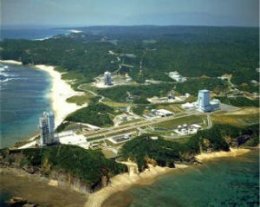 The Tanegashima Space Center is a Japanese launch site on the island of Tanegashima (30.2° N, 130.9° E). It is the largest such facility in Japan and used for missions of NASDA (National Space Development Agency). Launches from here are normally restricted to certain times of the year – between July 22 and September 30, and between January 1 and February 28 – due to safety range procedures set up as a result of pressure from Japanese fishermen.